The Abbotsford library has a new display for the summer of 2018: Indigenous Foodways: the story so far from UFV Library's Special Collections. Highlighting material from the Newman Western Canadian Cookbook Collection as well as a number of titles from the Heritage Collection, viewers can get a sense of how food practices and knowledge were communicated over the last 100 years. 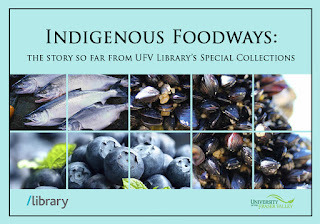 There are examples of the colonial perspective on First Nations' foodways as well as titles exploring the cultural and nutritional contribution of traditional foods, and finally, some cookbooks from the Newman Collection sharing recipes and stories. Teit, J. A., & In Steedman, E. V. (January 01, 1930). Ethnobotany of the Thompson Indians of British Columbia. Annual Report of the Bureau of American Ethnology to the Secretary of the Smithsonian Institution, 1927-1928. Yanovsky, E., & United States. (1936). Food plants of the North American Indians. Washington: U.S. G.P.O. Ellis, E. A., & Canada. (1979). Northern cookbook. Edmonton, Alta: Hurtig Publishers, in co-operation with Indian and Northern Affairs Canada and the Canadian Government Publishing Centre. Batdorf, C. (1990). Northwest native harvest. Blaine, WA: Hancock House. Kananen, L. (1975). Yukon cookbook. Vancouver, B.C: Douglas & McIntyre. Colwell, A. (2014). Galiano Island nettle recipes. Bennett, K. H. (1981). 49 north cooks wild: Wild game cookbook and outdoor manual. Edmonton: 49 North Pub. Webber, H., & Woolsey, M. (1996). Cranberries & Canada geese: Webber's Northern lodges : a second batch of our most requested recipes. Churchill, Man., Canada: Blueberries & Polar Bears Pub. Turner, N. J. (1978). Food plants of British Columbia Indians: Part 2. (Food plants of British Columbia Indians.) Victoria: British Columbia Provincial Museum. Framst, L. S. (2001). A Tahltan cookbook, vol. 2: More than 88 ways to prepare salmon. Cecil Lake, B.C: L. Framst Books. George, A. (2013). Modern native feasts: Healthy, innovative, sustainable cuisine. Vancouver: Arsenal Pulp Press. Poirier, K., & Nuu-chah-nulth Tribal Council. (2008). Čamus: (chum-us) adj.= Very satisfying when you've been well fed : Čamus ma = it tastes good. Port Alberni, B.C. (P.O. Box 1383, Port Alberni, V9Y 7M2: Nuu-chah-nulth Tribal Council. Wiebe, N., Desmarais, A. A., & Wittman, H. (2011). Food sovereignty in Canada: Creating just and sustainable food systems. Halifax, N.S: Fernwood Pub. B.C. Studies (Autumn 2013) Complete issue about ethnobotany in BC. We will open again on Tuesday, July 3. Click for more details on our summer hours! The problem with our Journals A-Z list has now been resolved. Our apologies for the inconvenience this may have caused you. Our Journals A-Z is not working properly today. The problem has been reported to the vendor and we are waiting for a fix. Please contact us if you would like information on a specific journal. We hope to have this resolved shortly.